12-metre 829 (Left) and 10.4-metre 701 (Right) (1996/11/09). 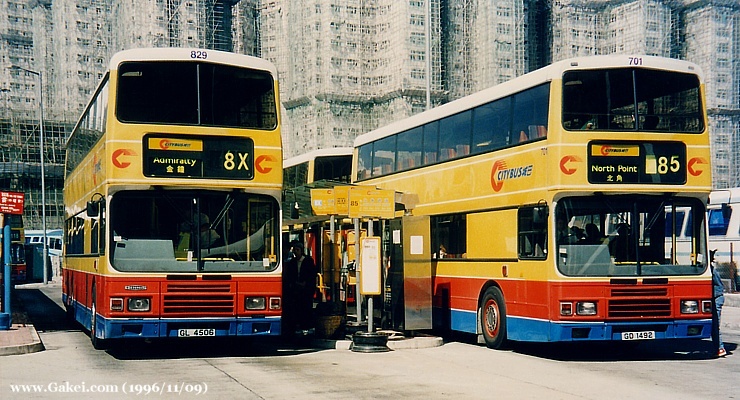 Citybus introduced 120 Dennis Dragons during 1994-97. 40 of them are 10.3 metres long, while the remaining 80 are 12 metres in length. All these buses are fitted with Duple Metsec bodies. However, as specified by Citybus, they are equiped with Alexander 'R'-type frontal panels. 701 (GD 1492) was converted to be the World's first air-conditioned double-deck trolleybus by Citybus for evaluation purpose during 2001. For photographs of Dennis Dragons in the Citybus fleet, please click the relevant links for the pages below, and click on the photographs to view the enlarged version.